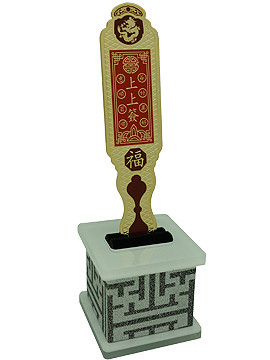 When one holds on to the "Seong Seong Chim" (Fortune Stick of Highest Hierarchy) it expresses the sentiment that one can PROCEED with any form of undertaking irrespective of whether the year's fortune is good or bad for him (according to his bazi or zodiac luck). With this "Proceed Talisman", you will experience a smooth path uninterrupted by setbacks, bad luck or sufferings. You will be injected with a dose of immunity to bad luck or misfortune. When you are at your lowest point of a cross road, this talisman promises that you will experience a reversal from shock where things will turnaround for the better. Your wish will materialize where you see successful outcome from your endeavor. It is also important to begin a new chapter of your life with a "Proceed Talisman" to ensure that good luck is always shining at your constellation, as it provides immunity for zodiacs which are pre-destined to suffer from problems due to the visiting of negative stars. It helps protect you against fortune reversal, transforms bad luck into good luck rapidly and magnifies good luck into even better luck. If you have been facing hardship for a while, this talisman actually generates better health luck, wealth luck, relationship luck and good fortune in all areas of your life. 1. A hundred of smooth undertakings in the forward. 2. Thousands and thousands of victories. a. good luck - everything flourishes and supported by lucky star. b. career advancement - intelligent achievement and promotion. c. longevity - live up to 100 years and completeness in life. d. happiness - having celebrative luck always and blessings from heaven. e. prosperity - abundance and accumulation of wealth. You may keep it in your handbag, use it as a book mark or park it in its sparkling acrylic stand that will be provided together. 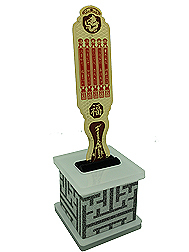 When parked in its acrylic stand, it is best displayed in your own bedroom, beside your bed or even keep it under the pillow. It can also be displayed at your personal zodiac direction. What is a Fortune Stick? 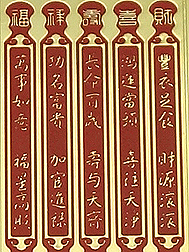 Fortune Stick divination ("Kau Chim") is a chinese fortune telling practice of requesting answers from the sacred oracle lot. It is based on the Book of Changes (I Ching). Fortune Sticks are a number of flat sticks stored in a bucket. 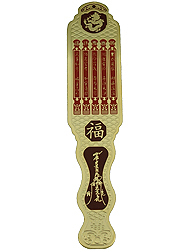 Numbers in chinese characters are inscribed on the sticks. This method of fortune telling involves shaking the bucket full of bamboo sticks numbered 1 to 78 in such a manner that just one number would jump out of the bucket. This number would then be ones fortune and a fortune teller would be required to explain it. There are five levels of fortunes, from excellent, good, mid, to bad and disastrous. Before one shakes the bucket, one must think of a "wish". 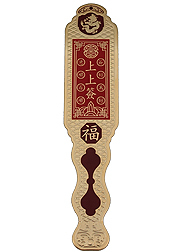 The luck and outcome of the wish will be foretold by the fate of the message corresponding to that fortune stick.